Regarding the headplate, Stephen told me that he has some Brazilian scrap that he's gonna look through and see if any of it is useable. Hopefully, he'll have some. If not, I can order an oversize ebony plate from LMI. Stephen doesn't mind going with an ebony headplate. The other alternative will be to go scrounge for something at one of the hardwood stores here. I'm thinking that the Brw veneer you have will be too thin for a headplate, right? I'd need something at least 0.080" thick. Thanks for the offer, though. Just wanted to give you some options. Didn't want your first commission to fizzel for want to BRW. BTW - I have used normal veneer for head plates many times. Usually I use some contrasting color veneer under the top show piece but I haven't ever had any issues. Okay, okay. Been meaning to post an update. Building a 10-string classical is more different that it appears on the surface. Not really harder, but a bit trickier in a couple of steps. WB, yup, we did get the headplate details sorted out. Dean, as a matter of fact, I did buy a brisket for the weekend. It goes on the fire tomorrow morning. Y'all want, I'll start a thread about BBQing over in the WoodShop. Unless somebody beats me to it, of course. Had to add a little water to the glue, though. I clamped and reclamped this setup a few times, before I was satisfied the headplate wasn't gonna slide around. Cut to approximate shape, and marked out for tuner holes and slots. So by this point the top was ready to be fitted to the neck. 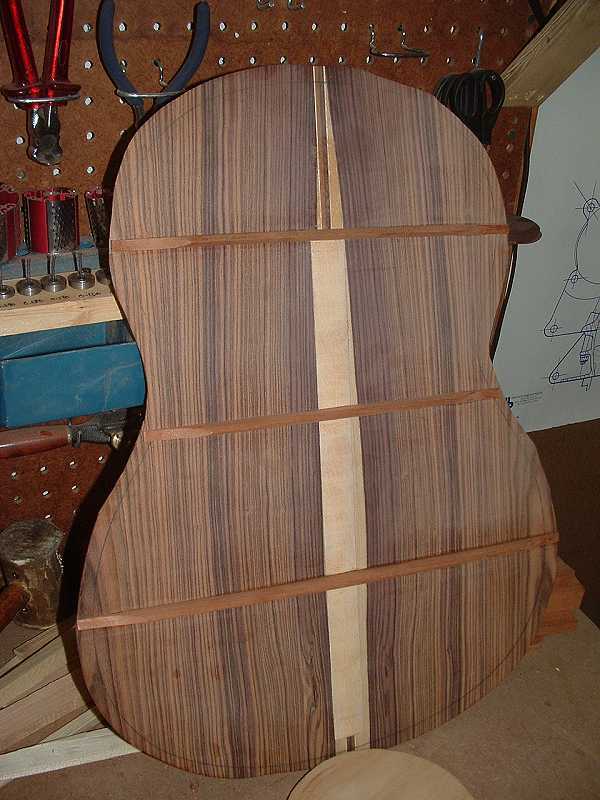 Had to cut the top at the 12th fret position, which is where it mates up with the top of the neck heelblock. Exactly perpendicular to the guitar centerline. The 12th fret line is closer to the soundhole than it is on a 6-string. About 0.100" closer. I like to sharply peak my back braces. I dunno if I'm saving any weight, because they're taller than what one typically sees, but I think a sharp peak is stiffer than a rounded one. Given that a classical's back provides most of the instrument's structural rigidity, and given that it will be having to deal with approximately 66% more string tension, any increased back stiffness should be a good thing. Glued the top down to the neck and sides, then glued down the flying tone bars, side braces, and linings. It was at this point that I discovered another important difference between 10-string and 6-string construction. Because of the extra neck width, the neck attaches to the body at a different location on the body. Since this location is slightly lower (toward the soundhole), the angle at which the side intersects the neck is greater. I didn't tumble to this until it was too late. Result? I've got gaps between the upper portion of the neck heel and the sides. Solution? Hell, I'll probably just shove some mahogany shims up in the cracks and chisel them even. Yeah, it'll be end grain there, but oh well! Oh, you meant, the correct solution! Well, it occurs to me that if I just increase the angle that I cut the neck slots, that this might work well for the upper half of the neck heel. But then that increased angle might make the sides look like they're forming a point at the base of the neck heel. So it seems obvious that the real solution will be to cut the side slots at the exact decreasing radius curve that the sides form during that same period of travel. Hooboy. Reckon I'll install a new bandsaw blade before I cut guitar 9's slots. 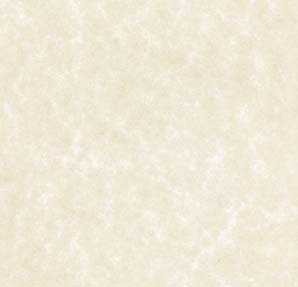 I picked up a handy tip from Lucio Nunez when it comes to basswood linings. Dunno about you, but I have problems with basswood creasing and wrinkling at the waist's bend. Even if I'm using a heating blanket. Guess Lucio has too. So, what he does is cut his basswood into strips that are half as wide. So, instead of 1/4" thick, they'd be 1/8", instead of 3/16", they'd be 3/32", whatever. These thinner strips bend ok. So, he bends up a bunch of the thin ones, then laminates pairs together. What I did was, after laminating the strips together, I set them on the mold with bending blanket and ran the blanket at 250 degrees for about 5 minutes. This softened the glue and allowed the two pieces to "seat" against each other. Worked well. Guess I should have taken pictures. The result, though was a set of nice, smoothly bent linings with tight glue lines. And no wrinkles! Next, I notched the back and linings for the back's braces. Took some tweaking before everything lined up right. 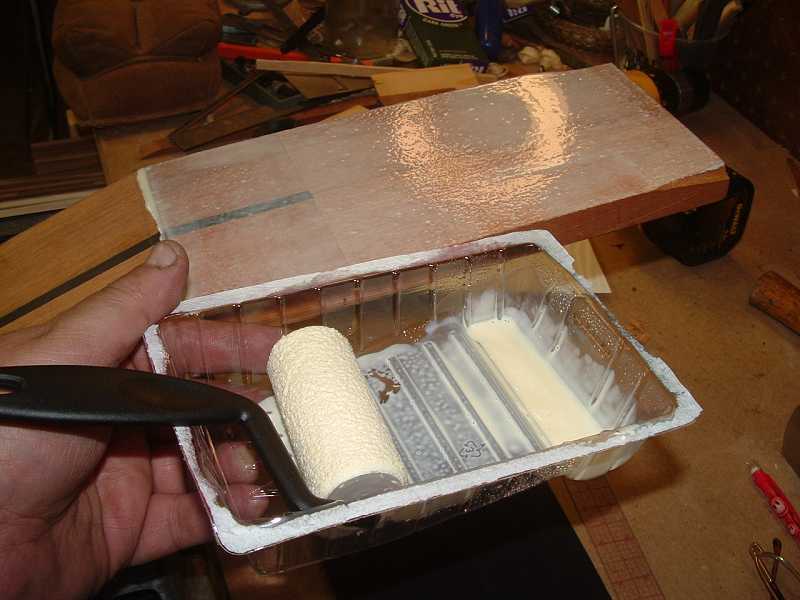 Then I spent some time with the guitar on the sanding board, insuring that everything was even and ready for the back. The back glued down without a hitch. Today I routed and inleted both the top and back for binding and purfling, bent some binding, cut and sanded down some purfling. Tomorrow, I plan to install it. Nice work Michael...I can see you have been focused and are making some headway. A challenging project- pushing you alittle bit. That's good in the long run. Nice clean work and I enjoy seeing it again. I thought of you this past weekend. A friend stopped in for a short visit and showed me his new classical guitar. It had small holes in the upper bouts to project bass response in larger auditorium settings. He said even harmonics in large auditoriums sounded like regular notes, from the audience. Maybe old hat- but new to me. I took a few pics. Robert Ruck built the guitar and I can send pics if interested. You are still with us. I have been checking this thread every once in a while to see what you have been up to. Have you decided on finish yet...french polish or KTM? I use sewing pins to keep things like this from moving during clamp up. You can locate them in a section that will be cut away later or cut them short to create a locating pin that stays buried inside the piece. They will drive easily into material such as mahogany, but you may need to go to a model shop and buy a set of micro drill bits to drill a hole that small in harder wood. This technique has made my fret board glue ups a breeze. I radius, slot and bind my fretboards before glueing to the neck. To make sure they don't move when clamping I locate a pin in the first fret slot and in the 13th (14 fret steel strings, 12 fretters make the adjustment ). I did have a problem once where the pin stayed behind when I tried to pull it out. I wound up bending it back and forth with a feeler guage until it broke off. There was still a small bit of it left in the bottom of the fret slot so I had to make a notch in the tang of the fret so it would seat properly. Just finished gluing in the buttsplice. Time to let glue dry and check messages. Dean, Robert Ruck is (was?) a legendary classical builder. I'm sure your friend owns a superb instrument. 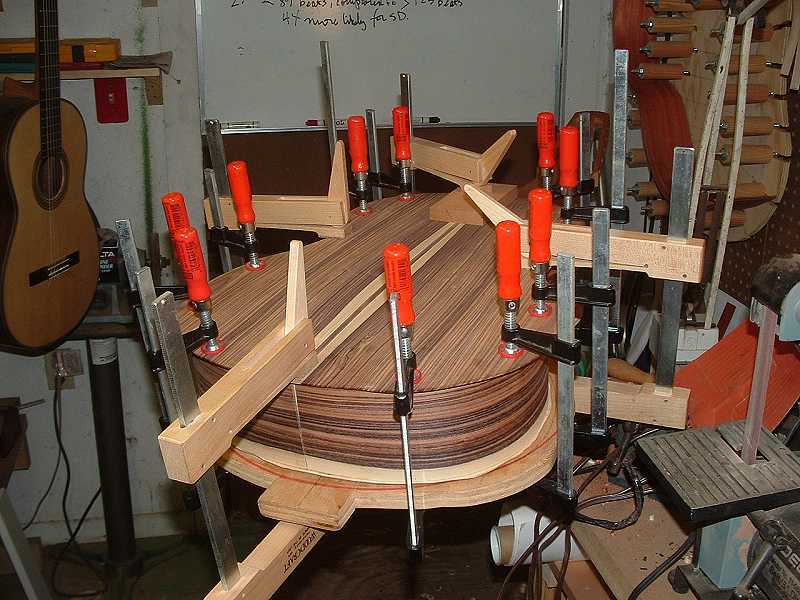 Nowadays, quite a few classical luthiers are installing various shaped holes into the sides. Check out the opening photo at Randy Reynold's site. I'll probably try porting a guitar one of these days. Heh. I could use guitar #1 as a testbed, and port it. Good sounding guitar -- just kinda ugly to look at. David, I plan to get some KTM-9 and brush it on. I like french polish a lot, but it is also a lot of work. Ah, BBQ! Tip roast is good. Back in California, if we were barbequing beef, we mostly barbequed tri-tip roast, which is probably the most popular cut for barbequing there. Brisket wasn't very common. Sounds like yours will be a good 'un. Me, I'll just be using our regular brisket rub, and smoke the meat over a low fire for probably 10 hours or so. Greg, I use locating pins as well, but so far not for the headstock. Prolly will some day when I get organized For now, I just use them to locate the fingerboard. WB -- 1581, eh? Now you got me wondering where Lucio got it from . . .
i am puzzled by this statement, and fail to see your logic. could you explain? an outstanding photo essay by the way. I probably could have explained it better. Here's the long version. When I began drawing up plans for this build, I realized that modern 10-string builders have to make a compromise between structure, aesthetics, and quite probably, sound. What you find is that the point at which the 12th fret is located is determined by a combination of fingerboard width and curvature of the upper bout. Let's say, for discussion's sake, that the width at the 12th fret is decided to be a typical 2-7/16" or 62mm. Picturing the rounded upper bout now, one can see that a 2-7/16" long 12th fret line will intersect the top by a shallow amount. 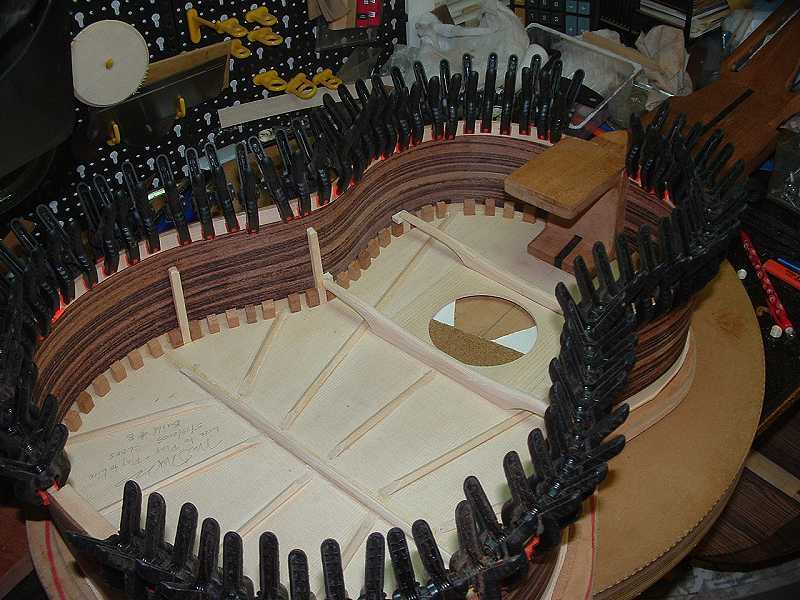 Obviously, the rounder the bout is, the further toward the soundhole the 12th fret line will have to be located before the top perimeter is intersected by the 2-7/16" wide 12th fret line. Now, let's take a look at a 10-string's 12th fret line. The 10-string fingerboard is 100mm (3.94") wide at the 12th fret. 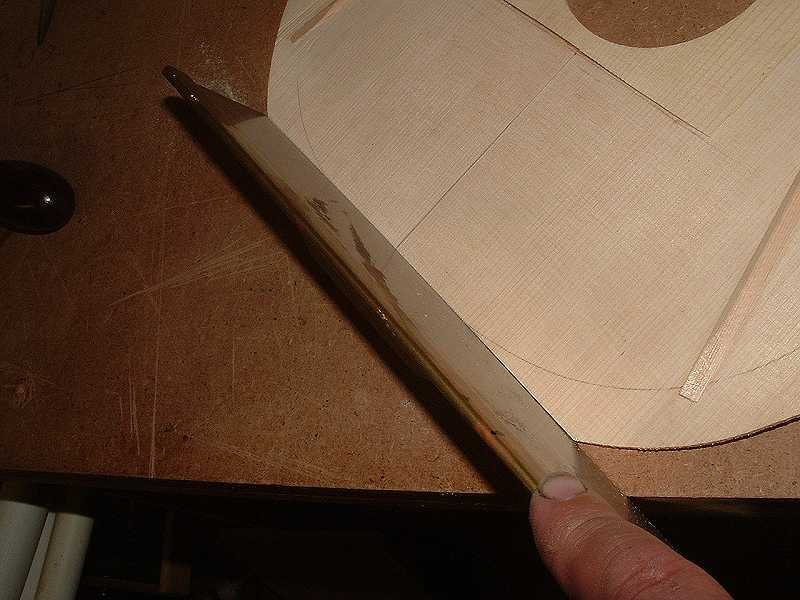 This approximately 1.5" of extra width means that the 12th fret will have to be positioned closer to the soundhole before the 100mm wide line intersects the top's perimeter. 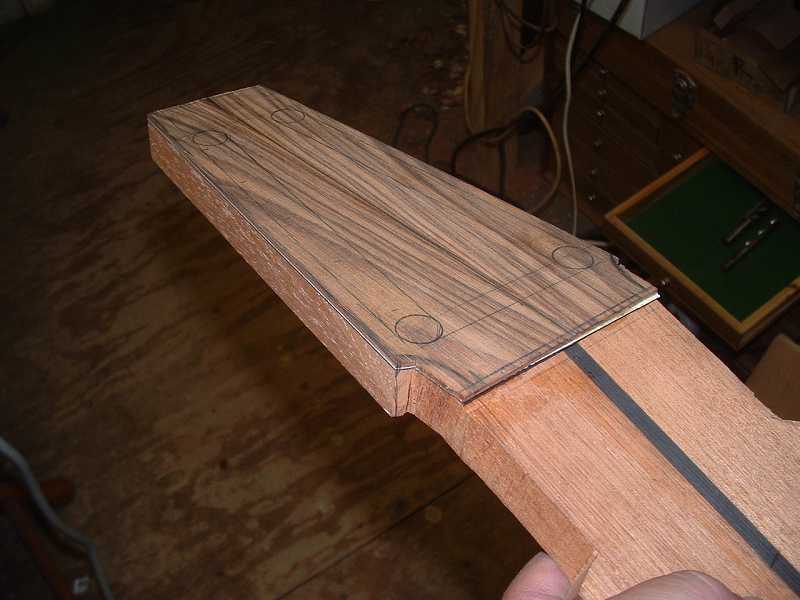 The 100mm wide 12th fret line is positioned lower simply because it reaches farther. 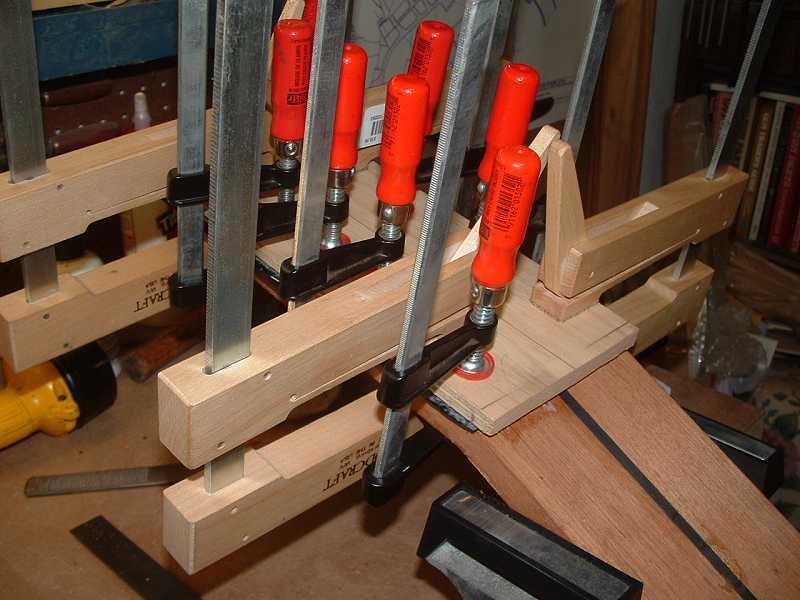 A bridgeward displacement of the 12th fret of course also means that the bridge itself must be moved back by an equivalent amount. Not a problem as long as the top is planned out from the beginning with an awareness of the atypical location of the 12th fret. The other issue is soundhole placement. 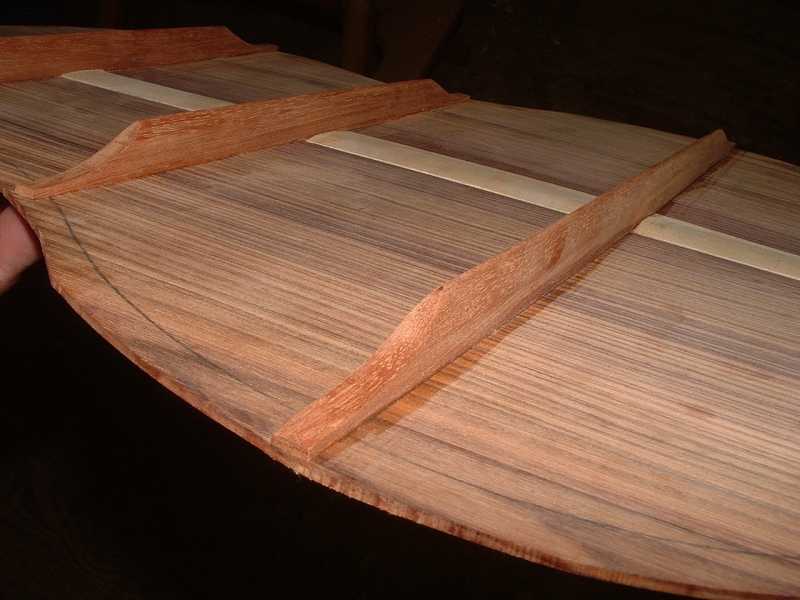 Since one is moving the 12th fret bridgeward a tenth of an inch, what about the soundhole? Shouldn't it be moved too? I don't happen to know how other 10-string builders handle the sound hole issue. Me, I decided to leave it alone. Mostly because I think moving the soundhole even 0.1" is noticeable, from an aesthetic sense. I suspect that changing its position probably would have some effect on sound as well. Perhaps as much as changing the bridge location. Glad to see you have taken some pictures as you progress. Also glad to have you participate. I was afraid we had upset you - then I said to myself - naaaa we didn't even come close. I will be interested in your assessment of those flying tone bars. I like the idea of the continuous brace running from the bridge area to the top of the upper bout. Makes good sense to me, even for a six string classic. How have you found working with Brazillion rosewood? i see what you are doing but not a reason for it. 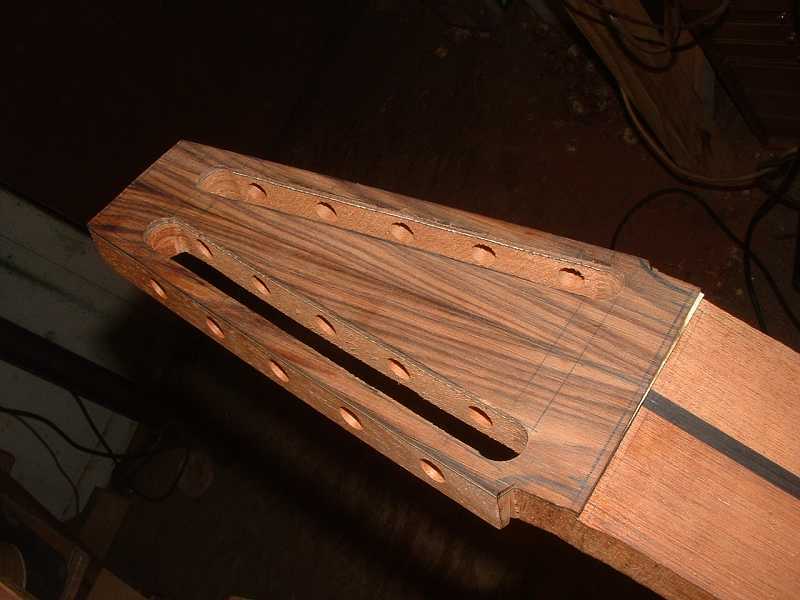 it is just that in my experience with classical, acoustic, bouzoukis and citterns, whatever, the 12th, 13th, 14th or 15th, or whatever, fret slot is normally positioned such that its cl is tangential to the top of the body, rather than forming a chord across the arc of the top of the body. am i correct in taking it that it is just for aesthetic reasons you prefer the latter? As for the cosmetics of it all, that is pretty much up to you. There aren't a lot of these things around for critics to compare to. You are the trail blazer - at least in this neck of the woods. If your customer is worried about it - well - that's another story. Then if you have something diferent you have a sales job to set him straight. Not aesthetics really as much as tradition. In classical construction, it is a matter of tradition that the 12th fret is placed at the point where a chord is formed by the width of the fingerboard at the 12th fret intersecting with the curvature of the upper bout.